John passed away peacefully in New Westminster, BC, on October 5, 2010. He is survived by Lois, his beloved wife of 57 years, daughters Susan Dicken (Gary) of Naramata, BC, and Nancy Banks of Ottawa, ON, and granddaughter Emily of Naramata, BC. Lois now resides in Summerland, BC. John was born on May 18, 1926 and spent an idyllic childhood in Kimberley, BC, with his parents, sister, brothers and treasured friends. He served in the Royal Canadian Air Force and the Canadian Army during the Second World War and was demobilized in September 1945. He studied commerce at UBC, returning to Kimberley each summer to work in the mine. While at UBC he joined Phi Delta Theta and remained in touch with his fraternity brothers throughout his life. Upon graduation John began a life-long professional association with the mining industry. He was knowledgeable about every facet of the industry, from the mining of the ore to its ultimate treatment. This work took him all over Canada, including the Northwest Territories, an experience he spoke of with great affection. 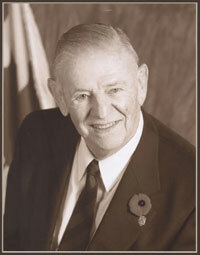 John joined the Canadian Institute of Mining and Metallurgy in Winnipeg in 1956 and served it in a variety of capacities, including chairing the Vancouver branch. He was made a life member of the Institute in 1990 and in 1993 was awarded a fellowship for outstanding contribution to the Canadian mining industry, an achievement of which he was immensely proud. John joined the Variety Club (later Variety) in the mid-1960s and served in a number of roles. In 1965 he was a founding member of the Engineer’s Club in Vancouver, serving as an officer. He was a member of the Board of Governors of Douglas College and of the Douglas College Foundation Board. John had immeasurable patience with children and animals. He loved golf, tennis, the outdoors, playing cards and games of all kinds. While in southeastern BC he became an avid skier, and when he moved to New Westminster he became very active in his church, singing in the choir. He had a beautiful voice and loved to sing. Once he retired, John and Lois travelled. A cruise through the Panama Canal, another cruise to Alaska and a train trip across Canada to celebrate John’s 80th birthday were particular pleasures. Wherever they went, John would make new friends. John liked people, and people liked John. He is fondly missed.